EPAII is a work that takes as its launching point the fifty psalm settings of Benedetto Marcello, a contemporary of Bach, who paraphrased or elaborated on the liturgical music of the Venetian Jewish community. I came across his music when I was living in Rome working on death will come and she shall have your eyes (2008) for string orchestra, mezzo-soprano, and archival recordings of Roman cantors from the 1940s. I was inspired by the jewish community of rome and venice that were segregated for so many generations since their initial arrival in Italy after the destruction of the second temple in Jerusalem. Without any real musicological proof, nor really requiring one for artistic license, I imagined that one generation passed on to another these ancient musical traditions, and through a kind of telephone-game-evolution, the music lost or gained its essence on each transference. When I came across the first edition of Marcello’s psalms, I read his introduction with great astonishment and pleasure: he, too, spoke of an imagined musical filament connecting the music sung in the Venetian synagogue of his day with an “ancient music sung passed down from Mount Sinai”. The theory, of course, can never be proved, nor should it be, in order to appreciate the beauty and brilliant inventiveness of his music. 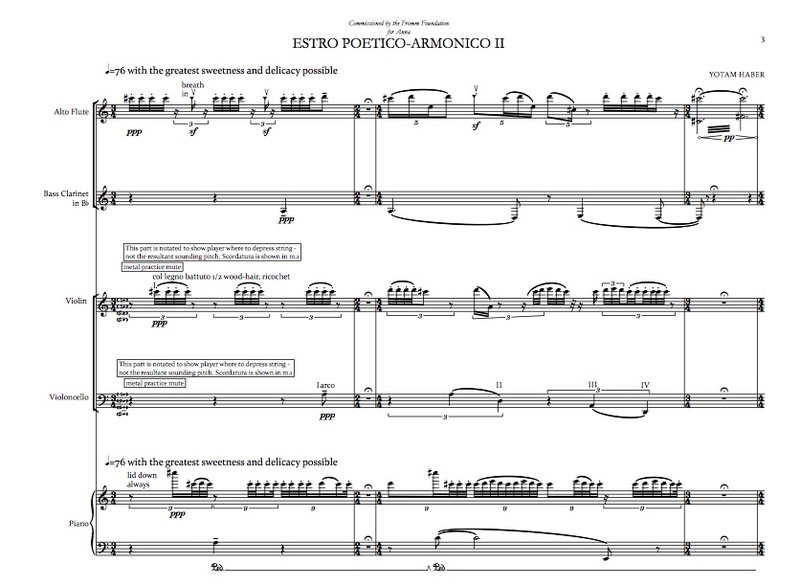 Estro Poetico-Armonico II is my re-imagining/re-hearing/re-creating in a very far-away, distant sense. The work was commissioned by the Fromm Foundation. February 9, 2015: New York Philarmonic “Contact!” Series. for more info, go here.